Can Am ATV Renegade Model Overview. 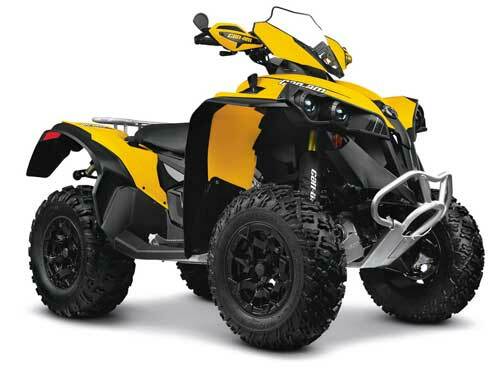 The Can Am ATV Renegade model line is the result of taking the utility oriented Outlander, stripping off the racks, upgrading the suspension and brakes, and bolting on sporty looking bodywork. Sounds simple enough, but it really doesn't give you a clue just how much performance is gained by losing some weight, improving the riding position, adding better controlled suspension, and 25% more braking. Hint - A lot! After riding any Can ATV Renegade, it's hard to convince most people that this 4 wheel drive ATV is based on a workhorse utility 4 wheeler. Can Am ATV Renegade 1000 XXC. The Renegade is offered in three displacement sizes, 500, 800, and 1000. A cross country racing package called XXC is optional for the 800R and 1000. So let's dive in and learn a little more about these 4wd sport ATVs. In 2012, all the Renegade models got the second generation chassis just like the Outlanders. Same new suspension geometry for better handling and traction, and better packaging of essential components for easier maintenance. Now we'll take a quick look at each Can Am ATV Renegade model. Can Am Renegade 500 with optional rear aluminum rack, mud guard kit, skid plate, sport windshield, hand guards, and shock covers. 500 - Even though it's "just" a 500, you still get a Rotax V-twin engine with fuel injection and liquid cooling. It puts out plenty of smooth, tractable power for a nicely balanced and easily controllable ride. Performance is equivalent to most big bore single cylinder 4wd ATVs from the competition. We think the Renegade 500 makes better use of the smaller V-twin than the Outlander. Where it seems a little strained and underpowered in the utility ATV, it feels responsive and "zippy" in the Renegade. This Can Am ATV Renegade model probably won't offer enough performance for the lunatic fringe, or for riders with plenty of wide open spaces to conquer. But for the rest of us, this is a great choice for an easy-to-ride-all-day 4 wheel drive sport ATV. 800R - Now we start to get serious. The Rotax V-twin puts out 71 horsepower, which should be more than enough for all but the clinically insane. Actually, at this level of performance, we think the better control offered be the XXC package would be a very good idea, even at the significant bump in price. 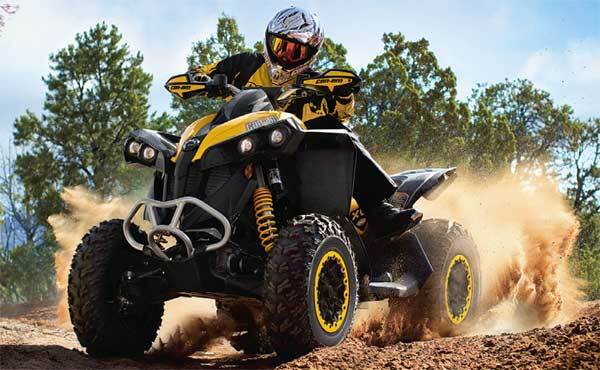 A Can Am ATV Renegade model like the 800R is much more at home in wide open spaces than on tight, technical trails. We would rate this 4wd ATV as being suitable for experts only. This ain't one to learn to ride on! It doesn't take but a few seconds of wide open throttle to have the scenery rushing toward you at alarming speed. 1000 - Speaking of the lunatic fringe! 82 horsepower in a 4wd ATV has to be getting pretty close. To keep it in perspective, over twice the horsepower of the Renegade 500 with the same chassis, suspension, and brakes. Take everything we said about the Renegade 800R and multiply it by 11 horsepower. 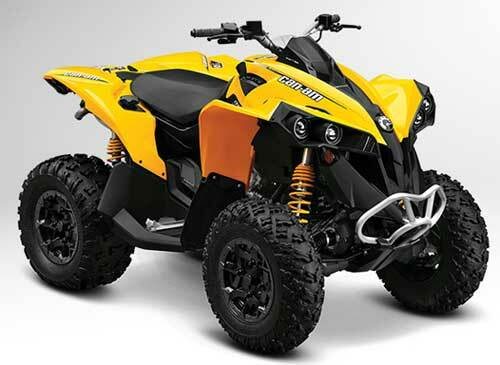 We have a feeling the Can Am Renegade 1000 ATV is more about marketing hype than actual need. Oh, we guess if you're a professional off road racer, you might have a need for one. Past that, we can't think of many people that really need to go faster than the 800R will go. Of course, if you're into bragging rights, and would like to say you have the fastest 4 wheel drive ATV on the planet, you might "need" one! 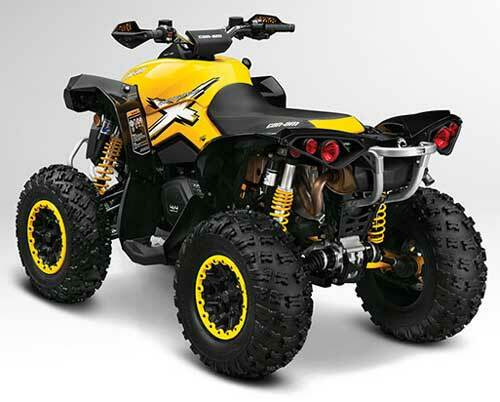 Specifications for Can Am ATV Renegade models. Can Am Renegade 1000 with cross country racing XXC option package. XXC Package - How to go faster with less drama. This option package feeds your need for speed with higher grade performance shocks, three level power steering, quicker reacting front diff lock, bead lock wheels, and an aluminum skid plate. It's only available on the Can Am Renegade 800R and 1000 models. It's pricey at about $2,500, but you couldn't duplicate it with aftermarket parts for any less. If you're considering one of the bigger Can Am ATV Renegade models, The better control offered by the XXC package deserves serious consideration. Back to World of ATVs Home. Don't Buy a Polaris UTV Until You See This Report. Our exclusive Guide covers all the models. 2019 Polaris ACE Model Quick Guide. Covers ACE 500, 570EPS, and 900XC. 2019 Polaris ACE Quick Guide. Details on features, prices, specs, and best buys. Covers the ACE 500, ACE 570 EPS, and ACE 900 XC. Polaris ATV - Covers all Polaris Four Wheeler Models. Exclusive Guide to the Polaris ATV Models including Sportsman, Scrambler, and ACE. Also covers Phoenix and Outlaw models. Complete with Reviews, Videos, Specifications, and More. UTV Guide - Covers the Fast Growing World of Side by Sides. The UTV Guide has pictures, videos, reviews, specs and more about UTVs, accessories, parts, and where to find the best deals. 2019 Mahindra Roxor. The Mahindra Jeep gets Needed Updates. 2019 Mahindra Roxor review with details about some much needed updates. Details about new accessories for this Mahindra Jeep, along with updated prices, specs, photos, and more info. 2019 Honda Talon is Official! Honda makes the new pure sport model called Talon official with the announcement of two new models. Latest UTV News and Rumors. Keep up with all the latest UTV News and Rumors. Coverage of all brands and models. Be the first to learn about all the latest UTV accessories and innovations. Honda Side by Side Guide. Pioneer Specs, Photos, Videos, and More. Guide to all Honda Side by Side models. Pioneer 1000 and 1000-5, Pioneer 700 and 700-4, Pioneer 500, and Big Red. Info, specs, photos, and videos. Honda Talon Overview. 1000X and 1000R Models. Photos, Specs, and More. Detailed overview of the Honda Talon 1000X and 1000R models. Details, key features, photos, videos, specs, and more info. Your Guide to all the Kawasaki ATV Models Including UTVs and RUVs.